For years we read and hear about how people think the MINI is too confusing to use. With it’s toggle switches and bonnet release on the passengers side of the car (except in RHD markets), it took some getting used to. Not so much with the Ford Fusion. What you are looking at above is the center console. On that console there are, in total, 50-ish buttons that control everything from the climate to media playback and other sync services. This does not count the additional 24 button that are on the steering wheel or the 13 buttons that are on the drivers side door. 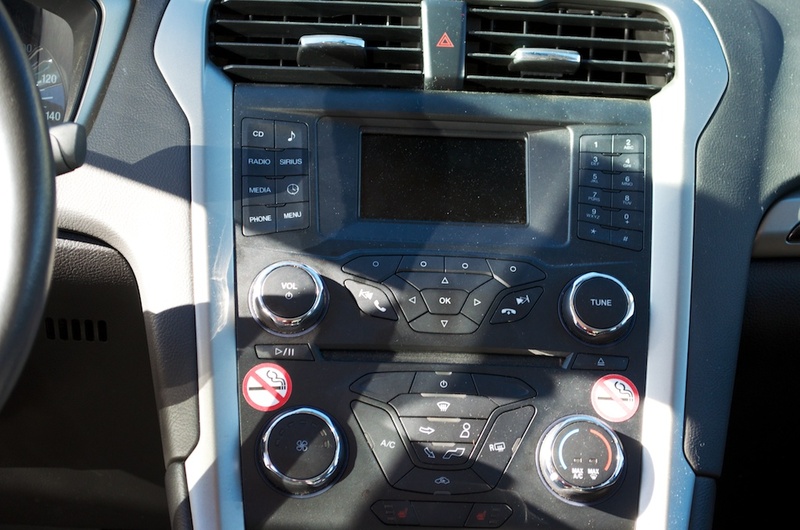 In total, there are over 70 controls available to driver of the Ford Fusion, with a good number of those buttons controlling options on screens that have multiple menus. The system is so confusing that it took me almost 30 minutes to figure out how to pair my iPhone to it (without a users manual), then once it was paired, it took a long Twitter conversation with @FordService to actually use it for audio playback. They were terrific in getting me sorted out, but that doesn’t excuse the fact that I needed them to. The number one issue with this system is that it has no memory. I was playing audio via bluetooth for 7 hours. We stopped for fuel (a point I’m coming back to) and when I got back in the car, it had switched to an input that I wasn’t using, instead of staying with the Bluetooth. Once I was told that the best way to interface with the system was via voice, it was easier to deal with, slightly. But, then, why all of those buttons? I recently got to play with a new BMW and it’s new system. There is a single interface point (just like MINI Connected). 1 knob to control everything that can be controlled through the system. Sure, until recently the BMW was even more confusing, requiring a 3 day class to learn properly, but the new system is much better, much more thought out and easier to use. This Ford system, in comparison, is complete rubbish. Next time someone tells you the MINI dash is too complex, have them look at any other car and get back to you. This isn’t to say that the MINI center stack or MINI Connected is perfect. Far from it! But it is much better than the Ford Sync system. Other than that, there were a few other things that caught me as odd. One being the little piece of window in the corner of the doors. Something that appears to be a left over from the windwing era, instead of making the window all 1 piece. Also, the side mirrors only go out so far. A fault that I’m sure Ford is aware is, since there are small blind spot mirrors in the outside corners to help. They do, but it’s like using the rear view mirror in a Clubman; takes some getting used to. And it’s big. I mentioned this before, but I mean it’s big, in a burly, football player kind of way. When I’m sitting in this car, the beltline comes to my shoulders, as does the top of the hood. It doesn’t feel like you are sitting in a hole, just like you a very small in comparison to the size of the car. This might be me speaking as an owner of a MINI Cooper here, but it’s still worth noting. I, much like you, hate buying fuel. This is something that happens frequently and often with this car. And not because it gets poor fuel economy, which we averaged about 25MPG (not bad for a car of this size and/or the weight of our collective right feet). It’s because it has a fuel tank that felt smaller than the one in my MINI. The most fuel I was ever able to put into the car, with the needle on E, was a little more than 12 gallons. During normal daily operation this is probably fine, but on a proper road trip, nothing kills a buzz like the smell of gasoline. Overall I liked it. I was even a little thankful for the automatic transmission while I was sitting, parked, in Southern California’s world famous LA traffic. Don’t get me wrong, it was still a soul sucking device that really hindered the overall performance of the car, but after 4 hours of traffic, it was nice to be able to get out and be able to walk. I’m really digging the cars Ford is making these days and really glad I had the chance to spend some time in this one. I just wish the controls weren’t so poor. Really spoiled the experience for me. Take the VW system – Bluetooth on it is horrible. While it has improved over the last few years, it takes forever to find and detect devices and the sound quality is awful especially compared to the MINI system. However, I like VW’s overall interface better, it’s easier to navigate and provides useful information automatically without the extra clicks that Connected requires. Thanks Michael! I agree. Neither the BMW or MINI systems are perfect, but when you compare them to the systems that other auto manufacturers are using, they are actually pretty ok in comparison. Hopefully they keep improving on it to make it even better still. Did you get MINI Connected in your R60? Or Nav? Connected only… I’m running CoPilot Live on my iPhone for Nav because it stores the maps locally as opposed to pulling tiles down “as needed” like Google, iMaps and others do… In my mind there’s nothing more frustrating than waiting for a map tile to load. Exactly why I’m going to have it in my next MINI that I am working very hard on purchasing sometime in the near-ish future.